Scribd is one of the growing ebook subscription services. They allow readers unlimited access to their catalog of 300,000 ebooks for a monthly fee of $8.99. Scribd offers apps for Android, iPad/iPhone, and Kindle Fire tablets. That’s one of the downsides of using Scribd’s service: you have to use their apps or a web browser to read ebooks from them; you can’t just use your favorite reading app. The good news is Scribd is adding new features to their reading apps to make them better. They announced updates for both the Android and iOS apps this week, and the updates add some much-needed features. Highlighting: Mark your favorite passages, paragraphs, and quotes – plus share them with your friends! 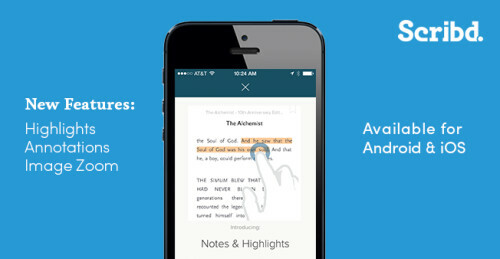 Notes: Jot down annotations and ideas as you read. Image Zoom: Zoom in on maps and other illustrations for a closer look. Scribd also mentions that all notes, highlights, and bookmarks automatically get synced across platforms so they are visible on multiple devices.